HeyUGuys were recently invited to a really interesting event, a debate between legendary film producer Lord David Puttnam and award winning City columnist Neil Collins. The debate was entitled “The script is mightier than the spreadsheet” and was pitched as an evening of bold banter and discerning debate. The event was incredibly enjoyable and lived up to the above description. At a time when, in the UK, debating is back in the public spotlight it was a pleasure to watch two intelligent and accomplished orators discussing an interesting topic. 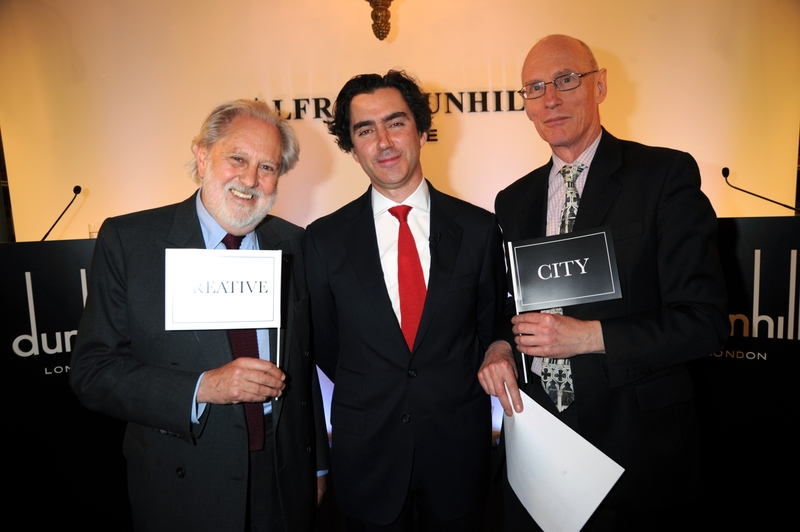 Held at the Home of Alfred Dunhill in London, the debate was held in front of a collection of people brought together to represent both the ‘Creative’ and ‘City’ sides of the debate. The introduction made it clear that Puttnam was the favourite to win and predictions from bookies who had been consulted put him clearly odds on to win. This did not seem to discourage Collins who still made a valiant attempt to fight the corner of the City, despite the fact that he pointed out he was not on the side of the ‘City’ that ran the economy into the ground. During Puttnam’s opening speech he produced a prop for the debate which helped with his popularity at the event. He had brought with him the actual Oscar (pictured below) which he was awarded for his work on the Best Picture winner Chariots of Fire. This, coupled with an excellent speech in which he included an anecdote about the power of cinema to even stop a civil war made Collins’ rebuttal an unenviable task. Collins made it clear though that he was not against the power of cinema (the script) and made well argued points about where British cinema has gone wrong in the past. His argument appeared to mostly be in defense of the fact that if it were not for the metaphorical ‘spreadsheet’ films of power and worth would never be made. Although a lively debate it was clear that the two men did not wholly disagree with eachother and they both seemed to appreciate the symbiotic but somewhat antagonist relationship between the ‘script’ and the ‘spreadsheet’ and that each had very different roles to play. Once the debate was over a vote was taken and the audience was asked to vote for either ‘City’ (Neil Collins) or ‘Creative’ (Lord David Puttnam). Unsurprisingly Puttnam won with a majority vote and the event drew to a close. Puttnam was awarded a cheque for £10 000 which he chose to donate to UNICEF and Collins was given a cheque for £5000 which he chose to donate to a charity for children affected by Down’s Syndrome. We are hoping to have some video of the event soon to give you a flavour of the debate but we’d like to know what you think, is the script mightier than the spreadsheet?